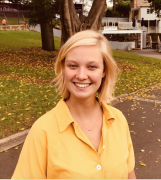 Alinde is a Dutch Public Historian, now living and working in Sydney. In the Netherlands she worked as a curator at the Amsterdam City Archives; co-curating two large exhibitions, conducting extensive archival research and writing and editing texts ranging from academic publications to exhibition texts. As a historical researcher, Alinde was involved in the making of a permanent exhibition at the Dutch Navy Museum. Since moving to Australia, Alinde has been working as a freelance historian. She has contributed to a large-scale heritage interpretation project and is currently conducting research on behalf of the NSW State Archives. Alinde has a Bachelor of Arts in History (2013) and Master of Arts in Public History (2017), both obtained at the University of Amsterdam.